Can you forgive the foliage of this unassuming wildflower for resembling a dandelion? You can after you smell the unbelievable cocoa fragrance of the chocolate daisy. And, although it would be too much to ask that the flowers taste as good as they smell, the chocolate daisy is classified as an herb, and can garnish your salads as well as your bouquets. 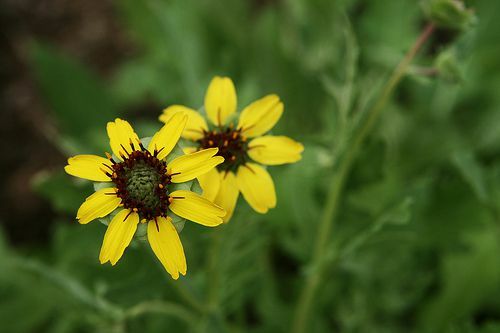 Although wildflower peepers can find these plants growing extensively across the plains and mesas of Kansas, Colorado, New Mexico, Arizona, Texas and Oklahoma, you don’t need to disturb their native habitat by collecting plants. You can collect seeds of the chocolate daisy in the spring and summer, and they germinate easily in lean soils. Plant the seeds anytime during the frost-free growing season. You can also start with young plants from specialty nurseries, including Mountain Valley Growers and High Country Gardens. The chocolate daisy is an obvious choice for the fragrant flower garden. Don’t hesitate to pick the flowers for a nosegay bouquet, as picking releases more of the heady perfume. Plant the chocolate daisy in the rock garden or alpine garden, as it appreciates the sharp drainage of rocky soils. Place it close to paths where you can observe the small blooms and catch a whiff of chocolate. Include the chocolate daisy in the xeriscape garden. It rarely needs supplemental watering. In fact, your plants will let you know when they receive too much water by flopping over. Add the chocolate daisy to your wildflower meadow. In its native habitat, the plants grow in places that feature dry soil on the alkaline side due to the presence of limestone. If this describes your landscape and you've struggled to find a plant that adapts to this sometimes barren environment, try the chocolate daisy. Replace a small area of your lawn with chocolate daisy plants. You can even mow the plants, and they will grow back vigorously, but never invasively. The chocolate daisy is an important source of nectar. Attract both butterflies and beneficial wasps to your flower garden with this plant. Foil deer with the chocolate daisy. Perhaps the fragrance most intoxicating to many humans is repellant to deer. What a happy coincidence! The adage “less is more” applies to the care of the chocolate daisy. Less fertilizer, less water, and less (or no) pesticide sprays are the key to this easy flowering perennial. Use your grass clipping shears to deadhead the many leafless stems all at once, to encourage reblooming. Mulch isn't necessary, but a layer of gravel beneath plants looks attractive and helps to hold fallen seeds in place for new volunteer plants. Do not attempt to divide or transplant chocolate daisy plants. Part of their drought resistant nature stems from the deep tap root that plunges beneath the soil's surface, and digging mature plants can disturb this root and damage the plant.